Looking for a super sweet gift for the best friend, sister, neighbor in the world? 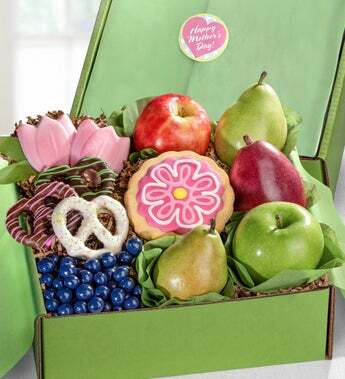 Here’s a boxful of delicious fruit and sweets that really say Thanks! Treat them to an orchard-fresh green D’Anjou pear, a red D’Anjou pear, a crisp Fuji apple, decadent Ghirardelli® chocolate squares and much more! They’ll love this incredibly thoughtful gift, bite after delicious bite.